This shot was taken during the wedding reception party at a Private Residence in Palm City, Florida. 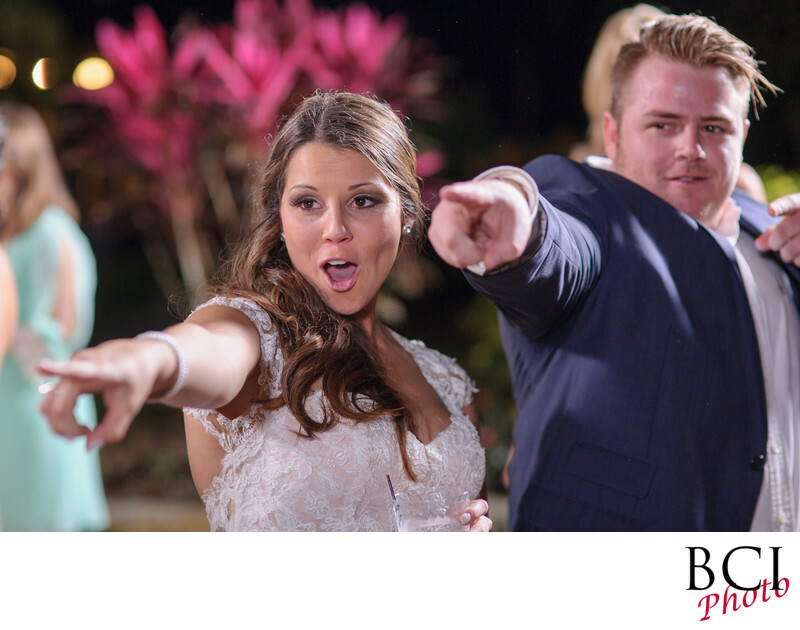 We love capturing the sheer fun and action during wedding receptions. We treat covering them, the same way in which we capture the action of an NFL game, Nascar Race, or any other sporting event. Here you can see the bride getting down with her guests during the reception. One of the ways we do this which really sets us apart, is in the way we light the reception. This party, was outdoors. No walls...no ceiling. To most photographers that makes for difficult going. Not us, we love this scenario. We light the reception dance floor area the same indoors or out. We don't rely on walls, ceilings or existing light, as all of that can be great, but usually is just not good. Instead, we set up our professional lighting scheme such that its perfect from shot one to the last dance. By doing so, we are now freed from constantly fumbling with the exposures, and are able to simply go hunting for the best expresssons, and the key moments that occur during your wedding reception. Another way we utilize the lighting scheme we just referred to, is to use our custom settings to shoot your guests in two totally different manners basically at the same time, providing a variety of looks all with perfect lighting for a totally unique set of image not possible thru traditional flash on camera techniques most companies afford.